The Lennox Lewis League of Champions Foundation is dedicated to inspire the “Next Generation of Champions”. We strive to nurture young people to strengthen their innate physical and mental ability to develop a high level of academic prowess, discipline, self-esteem, and confidence through the World of Boxing. To affect positive change by instilling the belief that success is achieved through sacrifice, discipline, motivation, dedication to hard work, and believing in oneself. 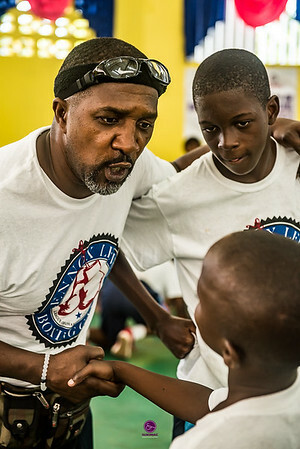 Our foundation strives to raise funds to build recreational boxing clubs for youth and provide resources to improve communities and impact the lives of underserved children in Jamaica, the UK, Canada, and the United States. Provide recreational boxing clubs for children to use as a safe haven to become inspired to achieve greatness. Nurture children’s innate physical and mental abilities to develop strong self-esteem and confidence through the World of Boxing. Provide academic support through homework/computer labs as a fundamental aspect of facilitating intellectual growth to highlight education as the main ingredient to achieving success. Provide warm nutritious meals for children who participate in our Knights in the Ring Initiatives and ultimately create a safe place for children to have fun through social interaction, and structured recreational, and physical activities.